I have been planning on putting this post up for a while now. It’s a little late for the winter effects but the value of this process can pay big dividends throughout the year for smaller producers. I’ve been asked for years what I feed to my chickens. After a few years of evolution, I’ve finally got myself on the right tracks for better year round egg production and have seen a reduction in feed costs with the added benefit of strong, healthy chickens. Before I get into detail, I want to give you a bit of back story into our road to discover. In 2013, we had a field that was newly seeded down for pastures. The crop specialist, Rich, was determined to plant a cover crop that would sprout fast and provide soil cover to prevent weed growth. The choice was made to plant forage oats. What are forage oats? Well, it’s the rudimentary form of oats. It’s got wide broad leaves that sprout from the ground after just a few days of germination. It grows much more like a grass but if left long enough will produce the seed heads just like an oat plant. As summer went by and we tried to get into the field to take the first cutting of hay, we experienced rain delays and scheduling issues. By the time we managed to get the field cut, the forage oats and developed their seeds and they had started to dry. Here on our farm, we like to feed the cattle baleage. Once the bales of hay are wrapped, they go through a fermentation process that “cooks” the grasses inside, leaving more available nutrients than standard hay and also leaves the grass soft for the cows to eat. Since some of the forage inside these bales were the oats, they were “cooked” too. That winter when we started feeding these bales, we noticed that one set of our chickens had stopped eating their layer mash (a special mixture of powder feeds that is formulated just for laying hens). Upon monitoring this group, we noticed that they spent all day around the hay feeders in the cattle barns. “Why?” we started asking ourselves. Low and behold, we had stumbled upon something that had us researching what was going on. Why would the chickens prefer the oats overtop of their own feed? What was soon discovered is an article about fermenting grains. What was the big deal? Why would chickens like the fermented grains better? Apparently, a little known fact about grains and fermentation processes is that when the grains start breaking down, the release a lactic acid. The lactic acid breaks the bonds within the grains compounds and makes the sugars and proteins more readily digestible. “Huh, who knew?” is what we were thinking. Off we set to do some experimentation! What did we need to do? According to a couple of reference (listed below), all we needed to do was add water, stir occasionally and sit back to wait. We started by using the layer mash we had. While it worked okay, the process took a lot of water and you had to keep stirring and stirring. The chickens did eat it, if there was no other food choice. Maybe my chickens are just picky, but they didn’t care for it one bit. The method was also long, sometimes taking two or three days to even start the “bubbling” needed. Last winter, I was extremely discouraged and went back normal feeding of just mash. The results were astounding and I didn’t realize the impacts it would have. Our chickens didn’t lay eggs. Their feathers seems more ruffled and they just seemed more down than normal. This last summer, I decided to give it another go for the winter season. I turned to a local farmer who plants a variety of crops and started talking to him about what my options were based off from what he plants. Matt set me up with a mix of crushed grains. The mix includes corn, wheat, rye and oats. It was mixed at 25% of each grain after it was augered through a pro-box and put through a roller mill. He then bagged it up in 50 lb bags for me to transport it home (and because I can lift that size bag, 100 lb requires assistance). Upon getting it home, I took an old folgers coffee can and filled it up roughly 3/4 full (to the top of the handle mold). I added hot tap water (roughly 140 degrees) until it was just covering the grain by about a 1/2″. I put on the top and set it aside. Later that afternoon, I checked it again, stirred it up and added a little more water to one of the two I had set up. Much to my surprise, the next morning I had bubbles forming on the top of both containers. I left the one I had added water to and just fed the other. At first, the chickens and turkeys weren’t too sure but by sprinkling some of the dry grains on top, they devoured what was left. I repeated the process for the container I had fed. On day two, the container I had left had fermented so much that there was literally mold growing on the top of the grain! Nope, that wasn’t going to work. Matt did such a great job with raising the grains and the processing that I only need to wait 24 hours! The routine now goes like this: Morning feeding, I take out two coffee cans of fermented grains to feed to roughly 50 birds. As soon as the mixture is plopped out of the can, it’s standing room only around the dish. The grains are devoured in less than 1/2 hour with not even a kernel or glob left! I refill the containers and bring them inside to repeat the process again. What’s the benefit? Prior to beginning the fermented grain feeding, I was getting roughly 2 eggs a day. The chickens were always huddled together and rarely ran around the barns. After just three days of feeding fermented grains, the egg production shot up to 6-7 eggs a day. After a week, the chickens were running around on days when it was -30 below outside and still laying an astounding NINE eggs a day from three year old chickens! This week, we topped our highest egg days that we’ve seen in months at 12 eggs. I can see a vast improvement in their energy, their overall condition and their eggs. I see the same thing in the turkeys too. I’ve also seen their water consumption drop. Probably because they are getting the moisture and flavored water from the grains. I might not have fancy photos like the other folks do above…but I do know this is the better way to go. We are feeding roughly half the amounts we were before and the layer mash that been given as free choice over two months ago, is still sitting there in the feeder. The wild birds and chickadees are loving it though. If you have any questions or would like to know more about the grains themselves, Matt is the guy to talk to! He’s available on Twitter and is full of great information about a variety of other stuff too (Just ask him about pressing ragweed for oil for confirmation). He can be found at @mdedrick1. If anyone wants to see photos of the entire process, the way I do it… Just give a shout and I will edit accordingly! Better management practices and additional rotations have great improved this pasture area. I arrowed the same tree referenced in both photos as a landmark. 2013~ This field had been planted the year prior and only had one cutting of hay removed. 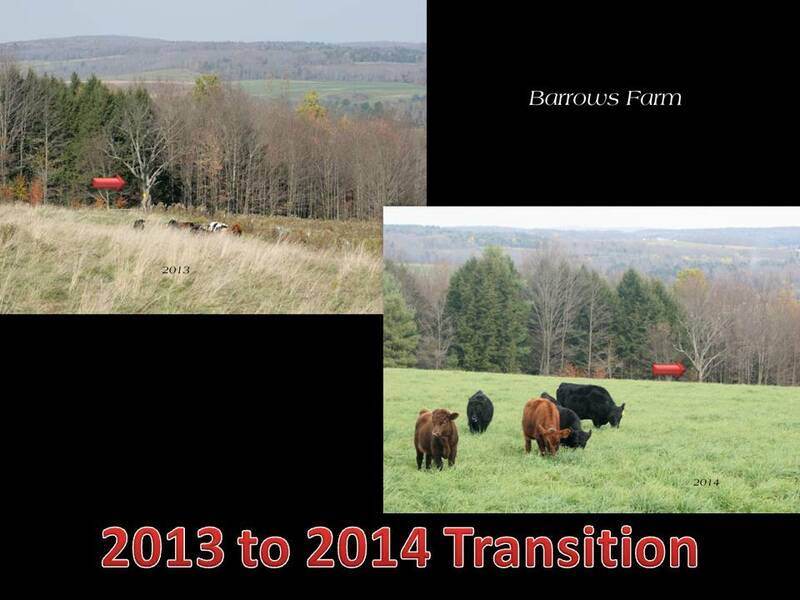 As our cattle numbers rose, we decided to put the cows into this pasture later in the year. The older growth and light colored grasses are from the previous years grasses and ones that had already died off due to colder temperatures. Most of those standing stalks were still left in the spring of 2014. 2014~This entire field was broken up into 10 rotational paddocks. Due to improper grazing methods the year prior, we saw additional weed growth and still some residual standing dead grasses remaining for 2012/2013. We decided that after the first rotation of grazing, the paddocks would be clipped. The clipping added organic matter for moisture retention and soil cover. When the cattle were turned into this paddock, the grasses measured approximately 11″ tall and fairly uniform (other than where heavy manure patties were located and the grasses were about 2-3″ higher). In 2014, we did some additional management testing. As each of the paddocks were clipped, we either left the animals in the same paddock for 24 hours or pulled them out prior to clipping. We had the same amount of rainfall for the first 21 days on two adjoining small paddocks, NONE. One we left the cows in and the other we pulled them out. Which of these paddocks do you think grew back better? Do you think there were any uniformity difference? Now that we are grazing these two paddocks again after the same amount of growing days, we are surprised by the results. Paddock 4: The day the cattle were turned into this paddock, the grasses were approximately 11″ (or knee high on my legs) for second grazing. There were large patches of dark green grasses (from manure and slightly better nutrients). This is the paddock that was clipped and the cattle left in for around another 24 hours. There are one or two weeds that did pop up, but nothing like the previous year. Paddock 5: I turned the cattle back into this paddock for regrazing just this week. The grasses were remarkably shorter with more defined patches of thick dark green grasses. The grass was averaged about 9″ tall. Take note of the patches of darker grasses. This paddock was clipped after the cattle had been located into the next paddock. Rainfall rates after the 21 days could have made an impact because the paddocks had 7 days different growth. Or could the differences be from the actual animal impact? We really aren’t sure but think the animals were a major contributing factor. Why would that impact be so important? Any farmer that has cut hay can explain that once grasses are clipped or mowed, they dry fairly quick. Grasses will lose a lot of moisture in that first 24 hours. What happens to grasses when they start to dry? The become brittle! As the animals walk, stand, and trample the dried grasses, it shatters or breaks it apart into smaller pieces. This could be the crucial difference. Not only do smaller particles breakdown to return nutrients to the soil faster but think about how sawdust can cover a floor faster than a tree. The particles are more evenly dispersed over the soil. I’m sure there are other benefits, like how any moisture is retained, too. All of this has been a “work in progress” and “testing”. I’ve recently heard lots of complaints about how Holistic Management doesn’t give a “one size fits all” prescription. FOLKS, IT CAN’T AND IT NEVER WILL! Why not? Holistic Management is about working with wholes. Not holes but WHOLES. I can’t identically replicate what I’m seeing as results on any other farm. Why? Every farm, even adjoining ones, will have different soil type, different nutrients, and even possibly different plants. What works here for me might not work exactly the same on a farm 50 miles away that has a slightly different climate. 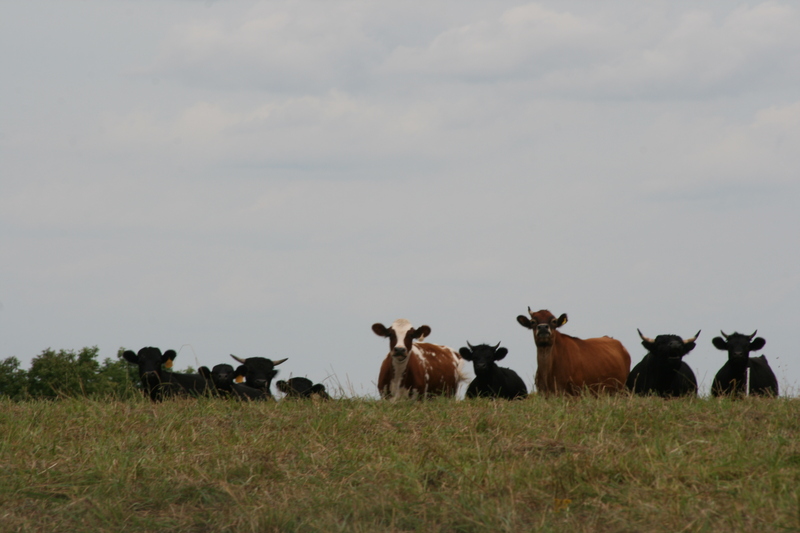 Holistic Management is about working with your whole environment. It covers everything within your own whole and you would be surprised how much variation there really is. I think that’s the problem with the mindset with most people in agriculture today. It’s all about a “prescription”. If a farmer plants corn, there are specific nutrients (nitrogen is a big one) that are needed in the soils. Since corn is planted as a monoculture, it’s easy to get a soil sample and apply whatever amount is needed to amend the soils. It doesn’t work that way with more complex situations. For example, our three main paddocks have a total of 5-7 different soil types and a range of nutrient variations. We have planted more than 15 different plant species into our paddocks and not one field is the same. You can’t do a “one size fits all prescription” in that scenario. Just like you don’t wear the same type of clothing in the summer as you do in winter months on the East Coast. The same methodology is used for management. Field A (spring) requires different management than Field B (winter) and even different yet than Field C (summer drought). Hopefully, you are starting to see and understand how Holistic Management is an ever evolving thing, on the same farm and difference from year to year. If anyone has any questions, concerns or would like to chat about what we do, please don’t hesitate to comment below. That’s why we share what we are doing (try to anyway). It’s been hard for us to adapt and learn, I encourage others to learn from our mistakes and trials. No farm is complete without a dog. Well, we now have three. Two are older dogs but the third is a 14 week old pup that we just added into the mix on Friday. I would like everyone to meet Brandy. Hi y’all! My name is Brandy! I’m a 14 week old bloodhound puppy. If you follow me on Facebook, Instagram or Twitter you would have seen that we have said her name was Honey. Here’s the real scope: When she came on Friday, her previous owner called her Vi, short for Vilula. After hours of attempting to get any type of response, other than her running the opposite direction, we went to another name that had been mentioned, Honey. She did respond…about 1 out of every 15 attempts, if that. After reviewing all of the paperwork that came with her, we noticed that at the top of the original sheets there was a name of Brandy with a number. At this point, before confusing her anymore, I reached out to the original seller and asked about this. I was informed that she had been called Brandy and pup-pup. I also learned that her favorite treats were bits of string cheese. I had really wanted to respect the lady that I had gotten her from with the name but when a stubborn hound (and bloodhounds are at the top of that list) refuses to listen, you need to show them a little respect and try to work with the dog. 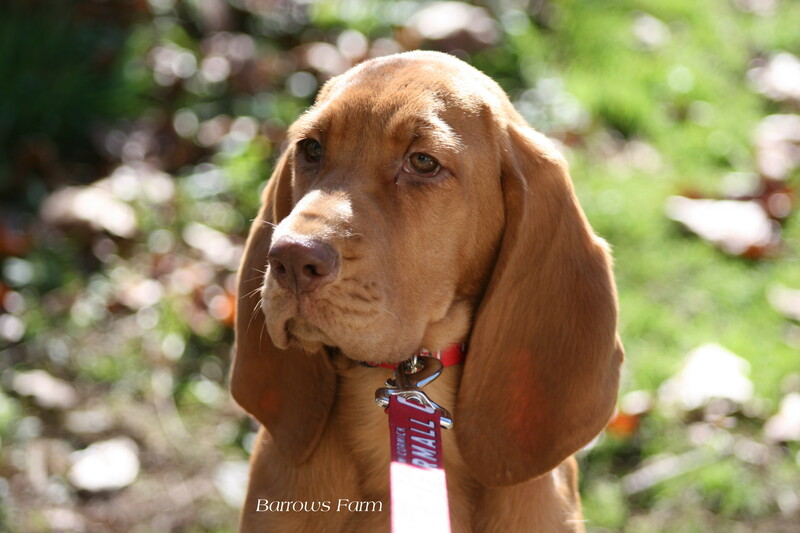 Bloodhounds are a great breed but they are far from perfect. They are stubborn to a fault and already have issues with selective hearing. Having issues with a name just compounds matters and they just refuse to comprehend. Think ultra selective hearing. We also needed to begin acclimating her to us. This is where our Make It Monday comes in! Hounds primarily use their sense of smell, especially bloodhounds. They can track smells that are a day old, lingering for miles in a matter of minutes. Knowing this is how hounds operate, I decided it was time to do a little crafting. Puppy loves toys, so I started thinking and researching ways to incorporate a few of our old clothes into something useful. We had just gone through some of Rich’s old jeans that were ripped beyond repair. I knew I had a couple of old tshirts. I had some fiberfill floating around. Grabbing a piece of paper, 8-1/2 x 11″, I folded it in half long ways and then in half again. I cut the end of the bone first. Much like you would cut a paper heart, just stop about halfway to the point. Then I cut straight from their toward the fold. When you unfold, you have a perfect symmetrical bone shape! Now that I had a template, I traced along the edge of the paper onto a piece of blue jean leg, placing the seam in the center. I did this to strengthen the point in the loops at the end of the bone shape. After cutting that out, I repeated the process onto a piece of t-shirt. I cut that out and pinned the two pieces together back to back. Starting at one of the loops, I sewed around the end of the bone, along the flat side, and then around the opposite end. I stopped sewing before the second flat section. Once the thread was secured, I turned the material inside out and stuffed with the fiberfill. I then pinned the flat side and hand sewed it shut. Project complete. Brandy loves her new toy and carries it with her all over the place. She even slept with it last night. She now has a favorite treat that smells like we do. If I had wanted to get really fancy, I could have embroidered her name of it but I have a feeling it will be shredded before the end of November. Every Friday, I will be doing a feature on one of the critters here at Barrows Farm. I want to be able to explain what each animal is like, how they came to be here and what’s important to us about them. Why do I think this is important? 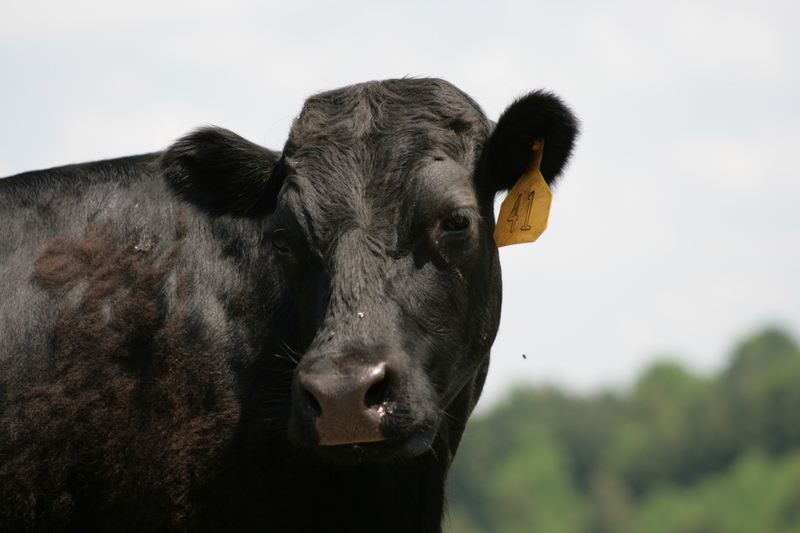 It’s important because as a farm, we wouldn’t be where we are today with each animal here. WordPress also gives me an outlet to hold open discussions with our fans that aren’t allowed on other blogging format. It’s important to us that YOU, the reader, have that ability. This weeks feature animal is Ruby. Ruby is a Lineback/Jersey cross cow and the oldest in our dairy herd. She came to live with us at about a week of age. We got her from Rich’s uncles farm and was originally one of a set of twins. When we first started, we didn’t have everything set up the way that it should have been. The calves, three at that time, were in the main part of the barn. They had free movement and a large area covered in sawdust and bedding. Unfortunately, the bull calf that was with Ruby and her sister Scarlett was rather dominate. One morning, upon arrival in the barn for morning chores, I found Scarlett on her back, wedged under the four wheeler. To those that don’t understand that cattle have issues with bloat, I will explain. Cattle need to have their heads up, not be facing down hill or rolled over so that the gases inside of their stomach have a place to escape. If left untreated or unnoticed, the gases start entering the bloodstream and literally poisoning the animal. We lost Scarlett because we just didn’t know she was in the wrong position for hours. I did everything I could to treat her, including burping her and propping her head up. It was too late, she was gone. About a week later, I found Ruby laying in the middle of the concrete floor. It wouldn’t have been bad if it was summer but unfortunately, it was the dead of winter in Upstate NY and it was cold. She was barely responsive and very lethargic. I went into immediate action and moved her to the sawdust pile, grabbed blankets from the house and made a call to the vet. Upon arrival she was given vitamin shots to boost her and the vet and I discussed how to rewarm her. For two solid days, I didn’t sleep. Instead, I walked back and forth from the barn to the house every fifteen minutes to warm blankets and keep changing them out. I used soda bottles with hot water tucked along her sides and slowly got her warm. I didn’t know if she would survive but I was giving it 110% to make sure she had every available treatment to get her over the hump. You have no idea how elated I was going into the barn the third morning to find her standing at the bale in the center of the floor nibbling on hay and drinking from a bucket full of electrolytes. I actually cried tears of joy. Now it’s years later and I still can’t get that feeling of connection out of my system. She is my cow. My favorite in the herd. She shares kisses and hugs. There is no better feeling in the world when you ask for a hug from a thousand pound cow and she wraps her head around you. Or that moment when you ask for a kiss and she takes that massive, scratchy, cat-like tongue and licks your face. She is my girl alright. Beyond her early life struggles, Ruby has developed into the perfect cow. She is easy to care for and hasn’t needed any treatments since. She has provided us with two healthy calves, one heifer and one bull. She gives us lots of milk, even with her calf still nursing. She’s a gentle and loving creature but is also the boss of the herd. She has no issues with keeping her body condition on an all grass diet, in fact she gets kind of fat. Ruby has had two calves on the farm now and just celebrated her third birthday. 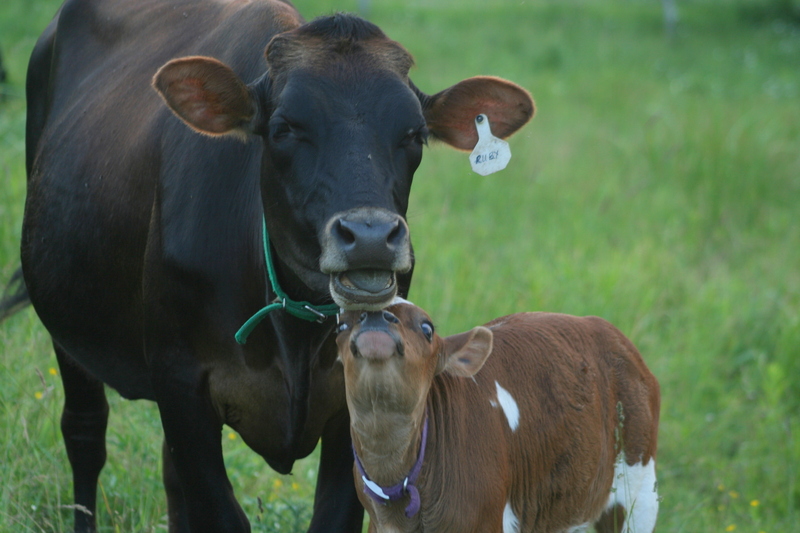 Her first calf, Suri, was a heifer (female calf) who is growing up to be very much like her mother. Her second calf, Ramrod, was a bull (boy calf) that is currently nursing and growing very well. Ruby is the first in the line of cattle we are really looking to integrate into future generations. In years to come, more of her offspring will come and they will become part of our herd. Her calves will take first priority in selecting which ones are used for the next generation because of the ability to do so well on our grass based farm. Her legacy will live on for many, many years to come and we look forward to have her around for many more generations of calves. I spent some time this year around the farm, experimenting with a macro lens that I recently acquired. 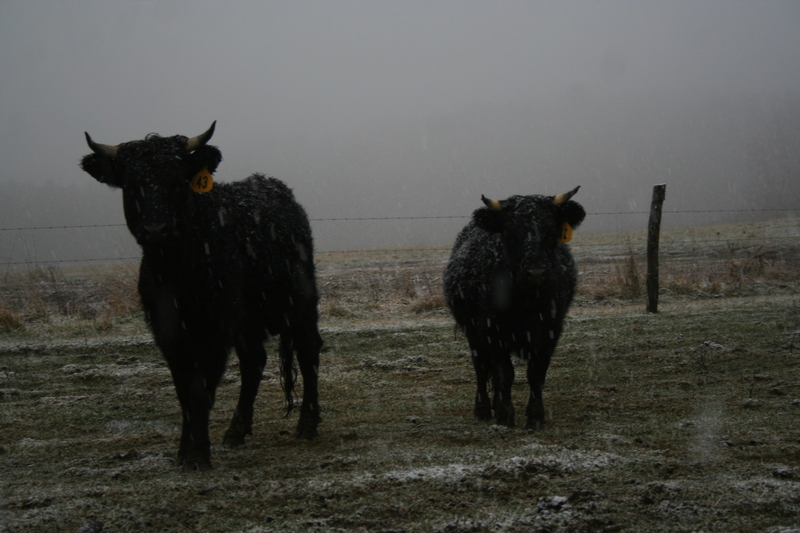 In my trips to water cattle, check on calves, or change paddocks, I would take my camera and new lens along. I’d never used a macro before and I’m still not all that adapt at using it but by trial and many, many errors, I managed to get some beautiful captures. As I started to photograph different flying insects like flies, bees and grasshoppers, I also started to notice a multitude of butterflies in all shapes and sizes. I didn’t even know there were varieties called skippers up to that point. I’d never really paid much attention to anything other than the ordinary and bright monarchs or swallowtails. What I discovered was a whole new world of pollinators, right in my farm pastures. I have photos of some that I still haven’t managed to identify. I found spots in one pasture that was loaded with so many butterflies the ground was almost covered. I will number the images…and there are lots! If you happen to know the common and/or scientific name, please comment below or send me a message. It’s been awhile since I’ve posted here. I’ve been busy over on our facebook page trying to keep everyone updated on a regular basis on what’s happening around on the farm. I’ve also been doing some random posts on What Farming Is webpages too. Neither really gives me an outlet to discuss what’s really going on or how we feel about it. For that reason, I’m back on here! With a new format and new content coming! For today’s feature, we are showcasing Minnie. Minnie is the oldest and smallest within our herd. She is an Irish Dexter. Irish Dexters are known for their compact size. 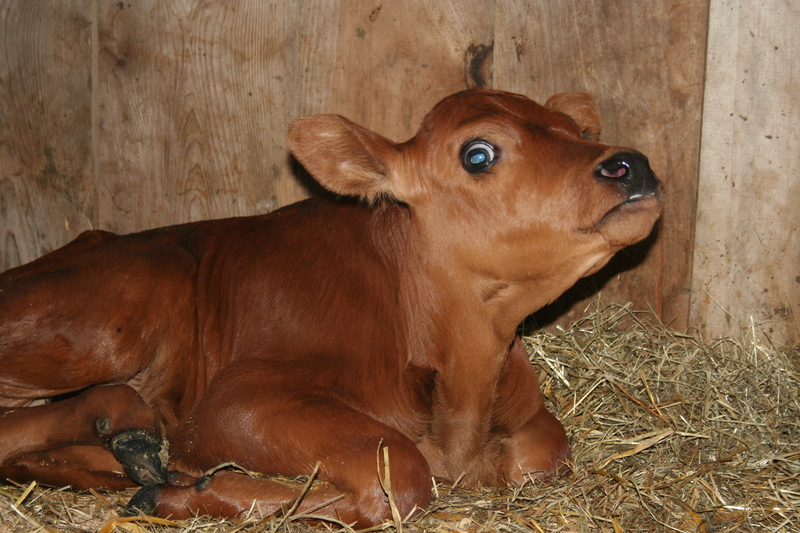 They are similar to the miniature cattle seen in other breeds, like Jerseys, but the Dexter’s are traditionally just a smaller, more compact animal. Minnie is what’s considered a short-legged variety. She’s just a short little thing. I stand 5’8″ tall with a 34″ inseam and she barely reaches my hips. She’s about 36-37″ tall. She’s now 6 years old and has resided with us since September of 2011. When we purchased her, we didn’t know much about Dexters and thought they looked decent for the breed. How wrong we were! As the years have gone by, she has really come into her own, gain weight, slicked up and is now rather round. It was amazing to see the transformation. Knowing what we do now, we are very glad that we got her when we did. Minnie has had three calves in that time, all three of them heifers (female). 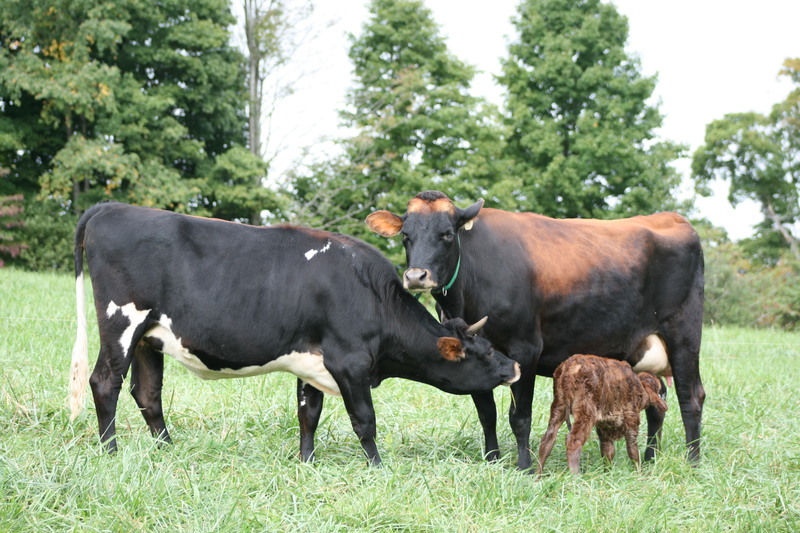 Her first daughter, Mini-Me, had her first calf this year and made Minnie a grandma. All three generations are still here on the farm. 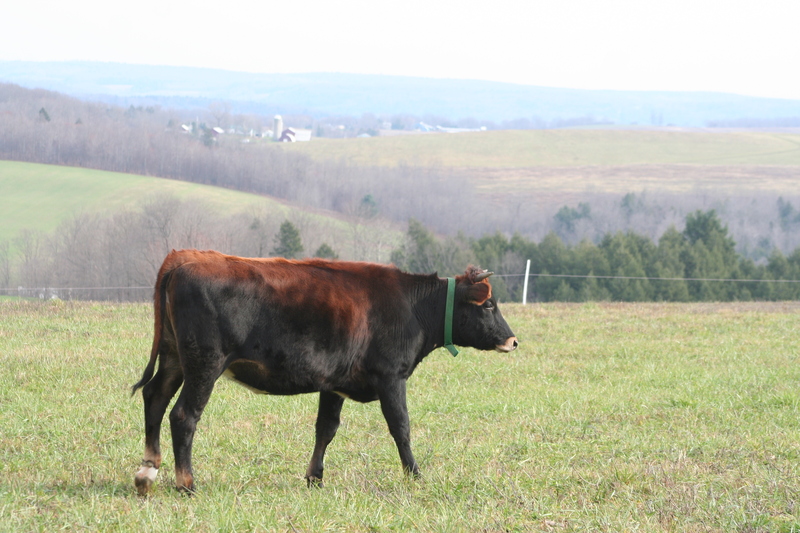 Her second calf, Amy, is a Dexter Jersey cross and will be giving birth to her calf Spring of 2015. Her third calf, Minnie-Pearl, was born this last spring. Dexters are great mothers and Minnie is no exception. She is protective of her young, gives them good milk and grows them healthy and strong. She is a herd mother. Many times, you will find her “babysitting” the group of calves. She’s docile and sweet in nature. She’s inquisitive too, smelling around at anything new. When Minnie came here, she was very frightened of everything. Any noise would send her running in the other direction. She didn’t want to be near people at all. Last winter (2013), we were finally able to pet her back as she lounged in the barn. It takes a long time to earn an animal’s trust, especially when they have never been handled. I wish you could all know that feeling and sense of accomplishment when you can finally touch an animal without them running away in fear. Minnie is one of our herd favorites for many reasons, including all those listed above. She has a lot of other great traits too. She is compact in size but holds her own in weight. She is very efficient at converting the grasses she consumes to meat and milk. Yes, Dexters are a dual purpose. 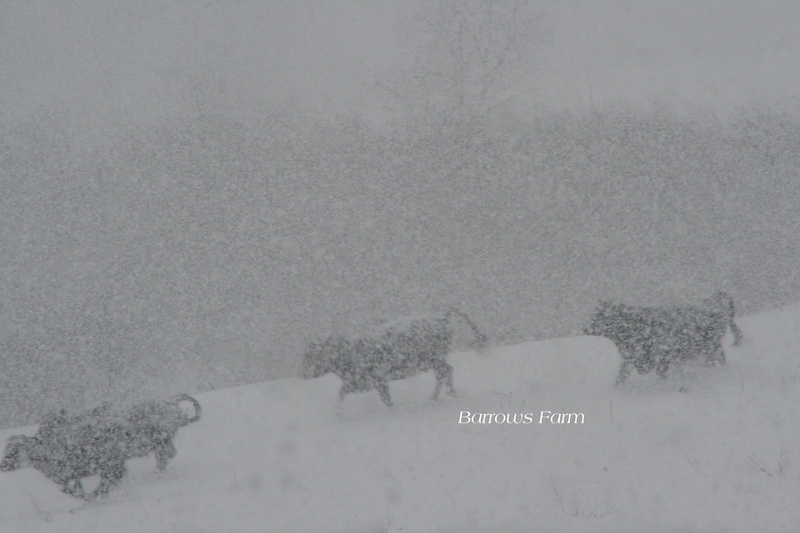 We love her too because she has given us great offspring that is the base of our herd expansion. She is easy to maintain with no signs of lameness. She’s never been sick since she’s been here. Her hoofs wear down perfectly, causing no need for a hoof trimmer. She steadily holds her weight, even when nursing older calves. Literally, cows just don’t come any better than her. She’s a perfect little Dexter. 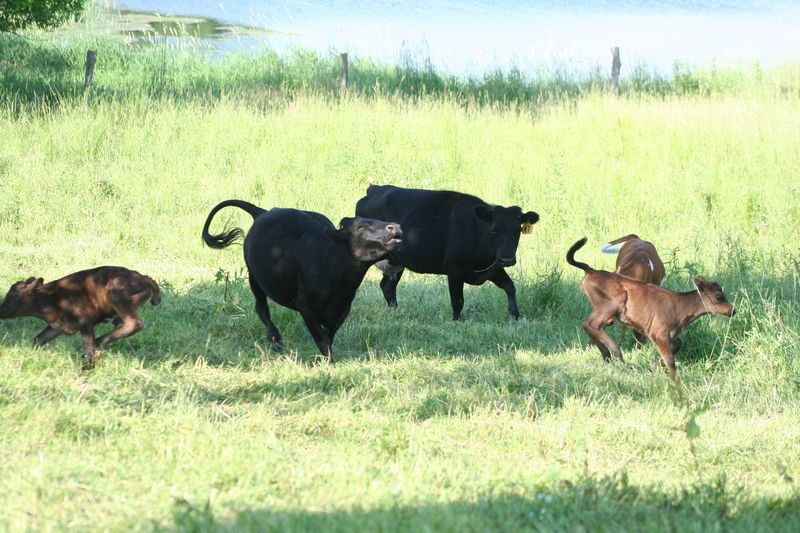 She loves to play with the calves, run through the pastures kicking up her heels and acting like a kid. Want to know what else is great? Since she’s a Dexter, she’s part of a breed that is known for it’s longevity! At six years old, she is just getting started in life. We’ve heard lots of great stories about Dexter’s that have lived well over 15 years of age. We are really looking forward to having her around for a very long time to come! Now, onto what everyone loves to see….PICTURES! This photo is from Dec. 2011. Minnie is the smaller of the two. Meanie (#43) is a year younger and much taller. 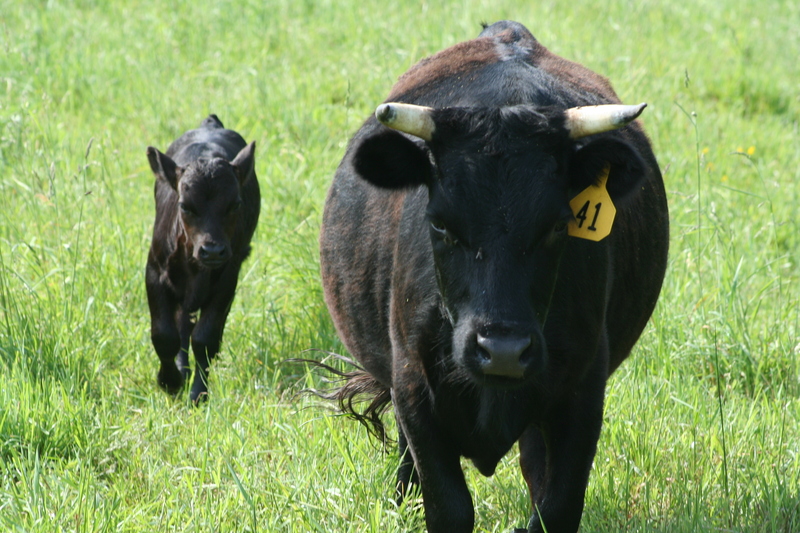 Minnie in 2013 with her first calf born on the farm, Mini-Me. Minnie and several of the other Dexters are out playing in the snow. Dexters LOVE days like this and are often found out playing like this. Minnie is the center animal. Look at that face! She is just the sweetest girl. Minnie is the one with her head up, tail curled and looks like she’s in pure bliss. Now available: HOODED SWEATSHIRTS FOR $25 to show your support!